The word “overwhelming” doesn’t quite convey the largesse of the place’s history, population and culture—thousands of years of people building, buying, selling, fighting, dreaming and worshipping. Because today is all about fun, the instructors have turned the slalom into a contest. Rumour has it that the best time so far was by a mysterious Kuwaiti who ran the course in under 23 seconds—a time none of the pro drivers has yet to match. Glory, and my pride on the line, I try to put the instructions coming through the radio to use, lightening on the throttle here, braking sooner there, minimizing understeer and trying to murder as few cones as possible in the process. With a car as powerful and capable as this one, simply jamming on the gas will add a huge burst of power, but won’t help me run faster through the course. This exercise is about finesse, man and machine working together as one, knowing when to let it out and when to rein it in. In the end, I don’t break the 25-second mark, and the prize goes to a good-natured Finn who attributes his success to lots of practice on his M3 at home. At any time of day, the view from the bar at Mikla would be stunning, but at sunset it’s almost magical. From the 18th floor of the Marmara Pera Hotel, ringed by a terrace complete with a wall of blooming jasmine and a bathing pool, Istanbul spreads out in all directions. The view itself would be enough to pack this place, but the restaurant below also happens to be one of the best in the city, its food the creation of Turkish-Scandinavian chef Mehmet Gürs, who combines a Nordic skill with seafood and an Anatolian sensibility for spices and fresh produce. We’re swapping stories from the day, and alternating between marveling at the cars we’ve just been pried away from and the expansiveness of the view. This is Istanbul in all of its fragmented, history-steeped, enigmatic glory: to the south, the domes and minarets of the old city break up the skyline, towering over the chaotic, narrow streets below. To the north, the skyscrapers, shopping malls and luxury boutiques of Etiler and Levent glitter golden in the distance, home to the city’s elite. To the east, the majestic Bosphorus, plied by a steady stream of yachts, container ships and pleasure cruisers, and beyond it the old port of Kadikoi and the tip of the Asian continent. As the sun dips toward the horizon, it turns the sky shades of pink and orange, bathing this city of 14 million in a soft, pastel light. As night falls, the city lights up below, seeming to stretch on seemingly into infinity. On the roof, Istanbul’s young and fashionable drink mojitos, music from the terrace’s sound system booming out into the night. Below, the streets teem with people and traffic, the city going on about its life as it has for millenia. At 7,000 RPM, the sound of the BMW M4’s engine is hair-raising. I’m pinned to my seat as the car screeches around a bend in the track. Behind the wheel is Stefan Landmann, a baby-faced Austrian driver who will be racing at the 24 Hours of Nürburgring the following weekend. Right now, he’s showing me what this car is capable of on the Istanbul Park F1 circuit. “170, 180, 190…late turn in, then hit the apex,” he narrates, taking his hands off the wheel for dramatic effect as the speedometer hits 230 in a straightaway. I admit to not taking in much of his instruction— I’m having too much fun being thrown back as the car accelerates, feeling the M4’s tires at the edge of their grip in the turns, its exhaust barking and growling all the way. 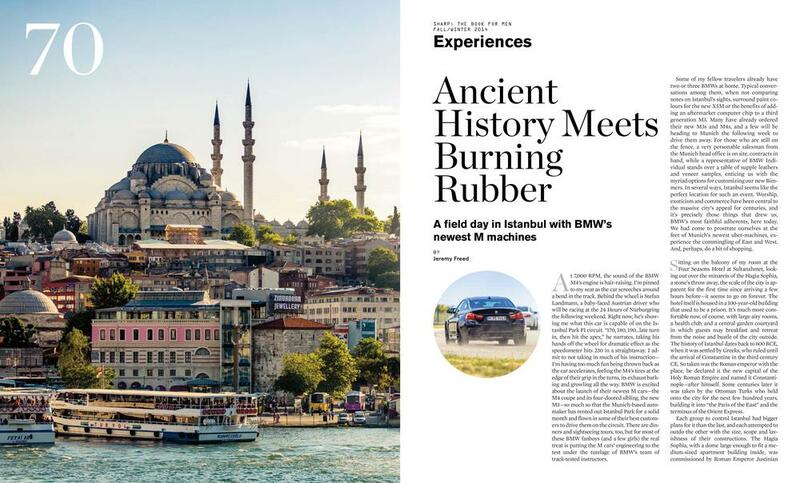 BMW is excited about the launch of their newest M cars—the M4 coupe and its four-doored sibling, the new M3—so much so that the Munich-based automaker has rented out Istanbul Park for a solid month and flown in some of their best customers to drive them on the circuit. There are dinners and sightseeing tours, too, but for most of these BMW fanboys (and a few girls) the real treat is putting the M cars’ engineering to the test under the tutelage of BMW’s team of track-tested instructors. Some of my fellow travelers already have two or three BMWs at home. Typical conversations among them, when not comparing notes on Istanbul’s sights, surround paint colours for the new X5M or the benefits of adding an aftermarket computer chip to a third generation M3. Many have already ordered their new M3s and M4s, and a few will be heading to Munich the following week to drive them away. For those who are still on the fence, a very personable salesman from the Munich head office is on site, contracts in hand, while a representative of BMW Individual stands over a table of supple leathers and veneer samples, enticing us with the myriad options for customizing our new Bimmers. In several ways, Istanbul seems like the perfect location for such an event. Worship, exoticism and commerce have been central to the massive city’s appeal for centuries, and it’s precisely those things that drew us, BMW’s most faithful adherents, here today. We had come to prostrate ourselves at the feet of Munich’s newest uber-machines, experience the commingling of East and West. And, perhaps, do a bit of shopping. Sitting on the balcony of my room at the Four Seasons Hotel at Sultanahmet, looking out over the minarets of the Hagia Sophia, a stone’s throw away, the scale of the city is apparent for the first time since arriving a few hours before—it seems to go on forever. The hotel itself is housed in a 100-year-old building that used to be a prison. It’s much more comfortable now, of course, with large airy rooms, a health club, and a central garden courtyard in which guests may breakfast and retreat from the noise and bustle of the city outside. The history of Istanbul dates back to 600 BCE, when it was settled by Greeks, who ruled until the arrival of Constantine in the third century CE. So taken was the Roman emperor with the place, he declared it the new capital of the Holy Roman Empire and named it Constantinople—after himself. Some centuries later it was taken by the Ottoman Turks who held onto the city for the next few hundred years, building it into “the Paris of the East” and the terminus of the Orient Express. Each group to control Istanbul had bigger plans for it than the last, and each attempted to outdo the other with the size, scope and lavishness of their constructions. The Hagia Sophia, with a dome large enough to fit a medium-sized apartment building inside, was commissioned by Roman Emperor Justinian and was the grandest church in all of Christendom for 1,000 years or so. When the Ottomans took over, they added minarets and turned it into one of the world’s greatest mosques. Not content with this, Sultan Mehmet I built the so-called Blue Mosque nearby in a bid to outdo Justinian’s handiwork. The stunningly lavish Topkapi Palace is just down the road, and it was home to a succession of Ottoman royals whose exploits make Game of Thrones look like Downton Abbey. There’s a hippodrome where the Romans watched chariot races and a Grand Bazaar—selling everything from Turkish carpets and tea sets to counterfeit sneakers—that has been going strong since the 15th century.